Your Guide to places to eat and drink in Alnwick. The Town has a wide range of high quality Restaurants, Bars, Cafes and Takeaways to choose from. For such a small town there really is an excellent choice of establishments. Below you will find highlights of some of our preferred places for each category. A full list, along with web links (where available) is provided towards the bottom of the page. If you eat at any of these places be sure to mention where you heard about them! Our featured places to eat are all marked on our interactive map of Alnwick Town Centre or Buy a full guide of where to Eat and Drink in Northumberland. Lilburns is a fully licensed, family run bar and restaurant on a quaint pedestrianised side street connecting the Marketplace and Bondgate Within. They have an excellent reputation locally for quality food and service, booking is recommended at peak times. Visit their Website for menus and more information. Relatively new to the Alnwick dining scene and located where Louis Steakhouse once was, Mivesi has quickly become a favourite. Beautifully presented, modern Indian food is what you'll find here along with a friendly and warm welcome from your host Amina. Her husband will be beavering away in the kitchen preparing some of the most flavourful, authentic food on offer in the County. We particularly enjoyed the modern take on the classic dishes and the home-made deserts, including two types of delicious rice pudding! Mivesi offers an English Cafe downstairs and an Indian restaurant upstairs, along with a takeaway service that's very highly recommended! You can even bring along your own alcohol with no corkage fee! The Treehouse Restaurant is not your average place to eat, which comes at a price, but if you're looking for a dining experience with a difference then look no further. The restaurant is set within the world's largest Treehouse, one of the Alnwick Garden's many attractions. There is a large roaring fire in the centre of the room and many trees growing through the floors, which is certainly a talking point. Food served here is all "locally inspired" and always features fish, seafood and organic meats from Northumberland's fine land. Lunches are served seven days a week and there is an a la carte menu on a Thursday, Friday, Saturday and Sunday evening. A Sunday lunch menu is also available with fixed prices for two and three course meals. You do not need to have paid entrance to the Garden in order to dine at the Treehouse, however booking is recommended at peak times. You can read a full in-depth review from our latest visit over on the Your Northumberland Guide Blog. Visit their website for sample menus and more information. Renamed and re-branded early in 2012 Di Sopra (Formerly Piccolino) have quickly garnered a reputation for good quality Italian cuisine, being especially good if you are part of a group. The restaurant is open Monday - Saturday only. Visit their website for more information. Somewhat of a gastronomic curiosity, at first glance Grannies appears to be a crowded shop almost overflowing with weird and wonderful boxes, jars and sweets. See past this though and you will find a Cafe that celebrates it's local area in the best possible way, by offering it's finest produce at a reasonable price. From sandwiches to Northumberland cheeses, Craster smoked salmon to local ice cream, it's all found here. Downstairs in the cellar there is a seating area to discover all that this wonderful little place has to offer. Fast becoming Alnwick's best hidden treasure, The Strawberry Lounge is located down an alleyway off Narrowgate. Don't let this put you off though, some of the finest treasures are to be found off the beaten track, the entrance to the alley is usually marked with an oversized wooden bear. Also known as a smoothie bar, this Cafe has wonderfully friendly staff and is especially well known for it's simply delicious home-made scones and top quality coffee. Make hunting the Strawberry Lounge down one of your top priorities! Set in the Marketplace, the Lunchbox does exactly what it says on the tin. If you're after a quick bite or a tasty freshly made sandwich without any particular frills this is the place to go. A self-titled Boutique Hotel, The Plough has become a popular place to have a drink and a bar meal. It does have a lovely fine dining restaurant, but for me it is at it's best as a pleasant place for a relaxed drink in it's stylish bar area, or just to sit outside with a bar meal and watch the world go by. 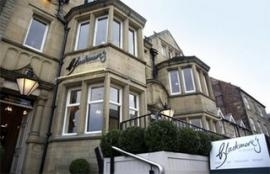 A hugely popular and lively pub venue in Alnwick. The Oddfellows Arms has become a great success because of it's characterful décor and friendly staff. Food is also served here, but you should definitely pop in for at least a drink while you're in Alnwick. Not necessarily for the faint hearted, the Tanners Arms is a bit of a local Pub, but you will find a friendly welcome here. It is a small place, not much larger than a living room and operates around it's Jukebox, which is a rocker's haven. Visit their website. Bright and modern, this is a good place to have a drink and a bite to eat. It can most easily be compared to a J D Wetherspoons for an idea of it's quality and decor, clean and simple. The Fish and Chips at Carlo's are extremely highly rated with locals and I certainly would never consider buying them from anywhere else when i'm in the area. Their gravy in particular is absolutely stunning! Visit their website for more information. Lovely Pizza delivered to your door or available for collection. Some of the best pizza that you can get from a takeaway, our favourite is their pepperoni and the Royale Special! They now have an online ordering facility on their website. Our complete guide to food in Northumberland! From the best local produce to our pick of the top restaurants, pubs, cafes and takeaways. The Your Northumberland Food Guide picks out the cream of the crop, where is the best restaurant in Northumberland? Need a family friendly restaurant? Or need to take the dog? Falcon's Rest - Clayport Street Public House Local's 'spit and sawdust' pub. Fleece Inn - 49 Bondgate Without Public House Warm pub, mainly for locals offering food and live music. George Inn - Bondgate Within Public House Local drinking venue, not highly recommended. Lunch Box - Marketplace Cafe Excellent sandwiches made to order. Market Tavern - 7 Fenkle Street Public House Value for money local food. Melvyn's Cafe - The Marketplace Cafe Attractive Cafe set in the town's beautiful Marketplace. Mivesi Indian Restaurant Restaurant English Cafe by day, Indian Restaurant by night! Oscars - Narrowgate Public House Bar with small dancefloor upstairs. Tanners Arms - 2-4 Hotspur Place Public House Small, but popular bar with locals, regular live music.